HelpCrunch has been selected among TOP 200 startups to participate in the 2017 Web Summit ALPHA Program on November 6-9 in Lisbon and will present its unique software for customer support, sales, and email marketing automation. Curious? Come visit HelpCrunch ALPHA booth A416 in the Software Exhibition Area on Day 1 of the event, Nov 7. Despite an increased focus on customer success worldwide, businesses are still struggling with building successful relationships with their customers. Oftentimes, due to using a variety of tools and solutions to resolve different needs, companies fail to convey communication efficiently and on time, which leads to managing customer interactions in a chaotic and disorganized way. To solve this problem, HelpCrunch has developed a fairly priced SaaS service that combines a perfect live chat, in-app messenger, email marketing automation and a simple helpdesk within the same platform. “The majority of popular live chats are not easy and fun enough to interact with. Most of them do not provide emailing. Many email marketing tools currently available on the market are quite complicated and cover just the email channel. The few available combined services are extremely expensive for most SMB companies. HelpCrunch provides all this at a very attractive price,”— says HelpCrunch’s Co-founder and CPO Pavel Pavlenko. HelpCrunch is perfect for SaaS and other web services, e-commerce site owners, online-to-offline businesses that need a fast and powerful tool to enhance their customer service, capture leads, effectively market their products and improve retention. All communications are synced across multiple platforms and devices — mobile, web, chat, email etc — through a single online account helping businesses and customers stay connected anytime and anywhere. “We are committed to bringing customer communications to a new level when people can connect to businesses in a way they like and are most comfortable with — through instant messengers. Be it a live chat on your website or a landing page, an in-app messenger right inside your product, a chain of emails, a brief talk in facebook messenger, or a quick question in whatsapp — all communications should be within one thread, making interactions fast, simple, worry-free and beneficial both for customers and businesses,” — Pavel highlights. About HelpCrunch. 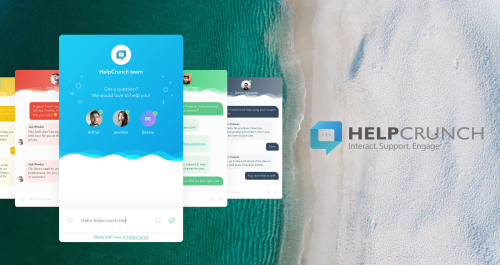 For web and mobile businesses who want to streamline their customer communication across different communication channels, HelpCrunch is a fairly priced SaaS service combining a perfect live chat, in-app messenger, email marketing automation and a simple helpdesk that provides a seamless way to turn prospects into customers, drive sales, give support and improve retention.